Ranthambhore Tale's.. .: Mis-Guided Guidelines? 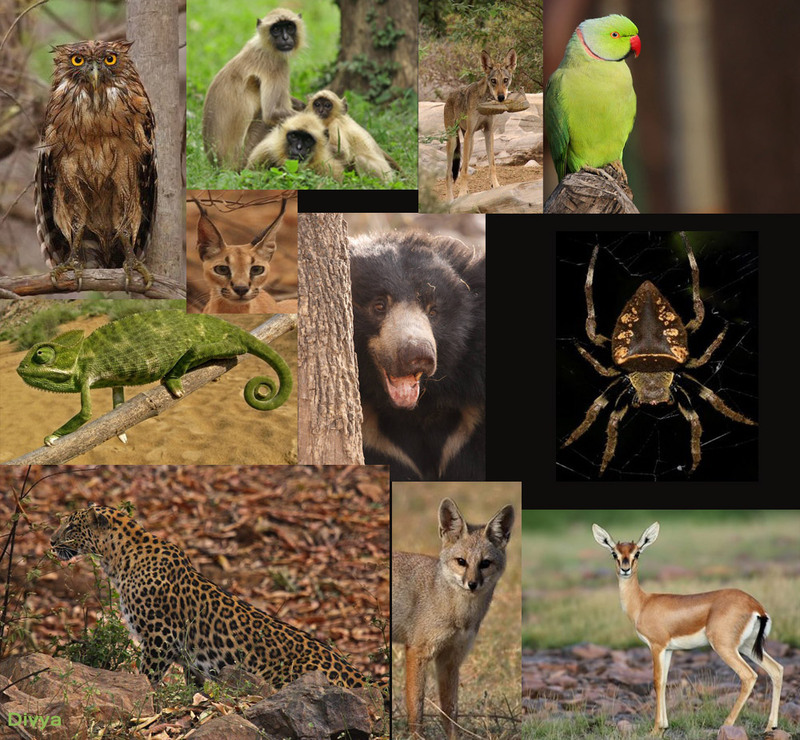 Last week the Ministry of Environment & forest (MoEF) on their website published a draft before issuing of the final guidelines for Ecotourism in and around Protected Areas. It has asked people to come forward and make suggestions over the draft guidelines. It is a fair and pleasant approach that the public is been involved in making such policies. These guidelines have mainly two objectives – provide alternative livelihood opportunities for the local communities and second having low impact tourism that protects ecological integrity of wilderness areas, secure wildlife values of the destinations and its surrounding areas. The entire countries conservation and tourism circles have been brainstorming on this issue. Many people - some are against the guidelines while some are in favour of it. Some conservationist and tourism people were involved in the initial stage of the guideline drafting committee and they say that though they were there but their concerns were not involved in making of these guidelines. The debatable topic here is that those suggestions from the committee members were not accepted, will the suggestions invited from local people be accepted; or is it just a way to show concern by the government. Looking at the report a nonprofessional may be baffled as it has so many scientific terms and mathematical formulas. Use of eco-friendly words make it sound like a scientific paper. However, as you go into understanding the depth of it the scientific uncloaking will reveal otherwise, the eco-friendly make up starts to fizz, which I will be discussing shortly. Total 282.76 or 283 km. 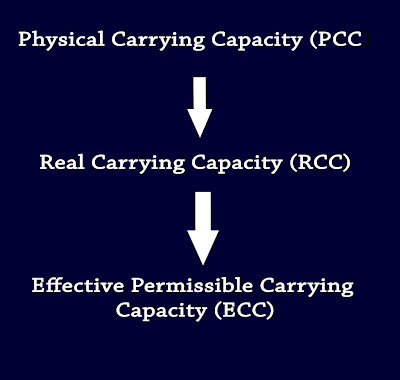 (b) Real Carrying Capacity (RCC): RCC is the maximum permissible number of visits to a site, once the “reductive factors” (corrective) derived from the particular characteristics of the site have been applied to the PCC. These “reductive factors” (corrective) are based on biophysical, environmental, ecological, social and management variables. Ml = 50 x 2 + 40 x 3 = 100 + 120 = 220 km. (ii) Disturbance to Wildlife: Here, species that are prone to disturbance owing to visitation are considered. The Central Indian barasingha, a highly endangered, endemic species found only in Kanha has a courtship period of about 1 month in winter, during which it is extremely sensitive to disturbance. Likewise, the peak courtship activity for spotted deer lasts for two months before the onset of regular monsoon. As far as tigers are concerned, newborns are seen between March and May and also during the rains; hence an average value of two months in a year can be considered as the matter phase. visitors that a site can sustain, given the management capacity (MC) available. ECC is obtained by multiplying the real carrying capacity (RCC) with the management capacity (MC). MC is defined as the sum of conditions that PA administration requires if it is to carry out its functions at the optimum level. Limitations in management like lack of staff and infrastructure limit the RCC. 0.30 = 41.4 or 40 vehicles / day. During peak season (winter months), the staff strength may be increased (only 10%) by deploying “special duty” personnel; this would enhance the ECC to 55 vehicles per day. Further, increase in the number of vehicles would lead to deleterious effects on the habitat. Description: there are three types of carrying capacity; Physical Carrying Capacity is the maximum number of vehicles, which can go inside the park. The second is the Real Carrying Capacity it is the number of vehicles that can be permitted, without disturbing the park’s wildlife and preventing the ecosystem from any erosion. 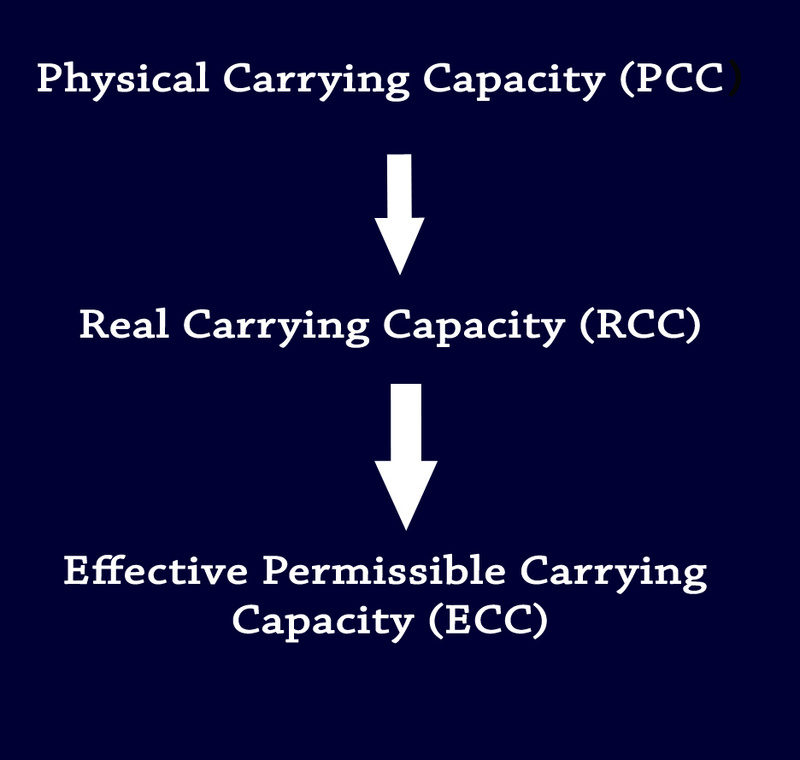 The Effective Permissible Carrying Capacity is the maximum number of visitors that a site can sustain, given the park management capacity available. How they calculated the different Carrying Capacities? Physical Carrying capacity (PCC) – they said that the square kilometre area could not be applied to the Indian context, hence they measured a road length and recommended keeping 500 meters distance between two vehicles to avoid dust. Which means two cars can be permitted in 1 km, and there are two safaris in the day. Hence, the total road length multiplied by 2 cars per km multiplied by two safaris is the total PCC. This is as simple as knowing how much water a bottle can hold. The main guidelines spoke about opening 15- 20% of the park area & then they came from area to road length to fit the formula. If we have contradictions in one single report then who will understand the report? What part of the road is taken for the calculation entire road of the reserve or just the one open for tourism? If the tourism area is taken then on what basis was the tourism zone opened? Keeping distance of 500 meters between two cars was calculated to avoid dust, but what if it is a wet forest where there is no dust and what if the tourist is ready to face the dust. Will this data fluctuate when there are no dusty days such as the rains or post rains? It is a very relative thing, which is considered. RCC means the actual capacity of ecosystem, which, is without disturbing or least disturbing the wildlife, does not cause damage to ecosystem like erosion etc, and can tolerate the movement of vehicles. RCC has calculated two types of disturbances one is the erosions of roads in the park and the other is disturbance to wildlife. They have classified two types of erosion - high and medium. On what basis were medium and high classified? In addition, how did they calculate that the medium is 100 km and high erosion is 120 km? They calculated the disturbance to wildlife in Kanha this part is the most perplexing part. 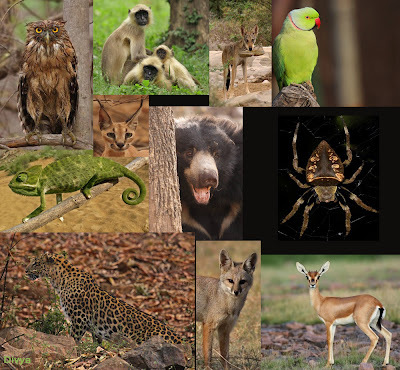 In the whole of kanha they selected only three animals – the tiger, barasingha and the spotted deer, why was Sambar, leopards, dholes, sloth bear, guar, hyena, insects, birds, other cats, and other canids not included? They believe that just these three animals get disturbed during breeding time only. This capacity is keeping in mind the management capacity available for the park. According to them just 30 % management capacity is available in Kanha and so they reduced the RCC by 30%. In a park like Ranthambhore department of tourism was managing this work; however, the forest department fought and asked to take up this tourism management work in their portfolio. If the forest department is so short staffed and working on 30% of its capacity then they should not be doing the tourism management work in the first place. What is the ideal management capacity does there any such calculation exist, how much staff is required to manage said tourism? Conclusion: they had to come out with a special figure, which they managed to achieve irrespective of the methodology of calculation. Good Write up. Very Informative! thanks Divya. The cess expected in addition to all the existing taxes will lead to highest tax collection from any business in the world, how can a business run with such high taxes and yet promote local communities who have to be trained plus maintain all other norms?